It has been three years since BMW announced its new i lineup, a range of so-called megacity vehicles beginning with the compact i3 city car and sleek i8 sports car. BMW’s most important project in the history, the i series which includes BMW i3 concept and i8 powered by an all-electric drivetrain.The idea behind i is to take motoring to efficiencies not yet seen, using a combination of state-of-the-art carbon-fiber construction and zero-emission electric propulsion. And, as BMW chairman Norbert Reithofer promised back in 2010, i cars will have enough financial initiatives to make it possible for anyone. 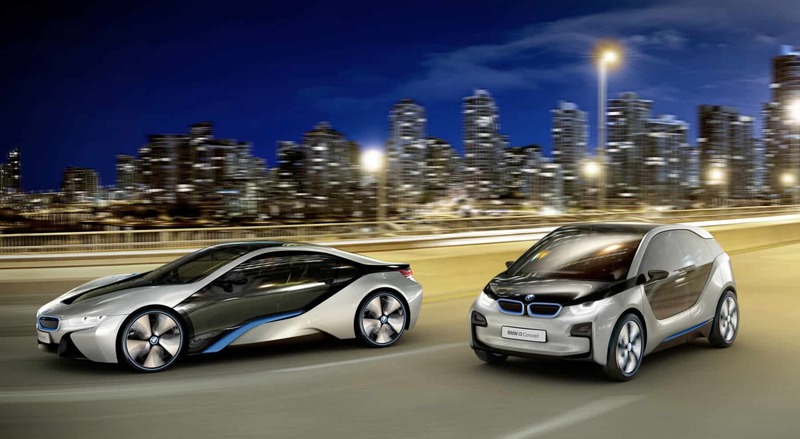 The BMW i series, i3 and i8 spearhead BMW i’s entry point. The former is for city use with an all-electric driveline, the latter is a gas-electric hybrid — the performance car. 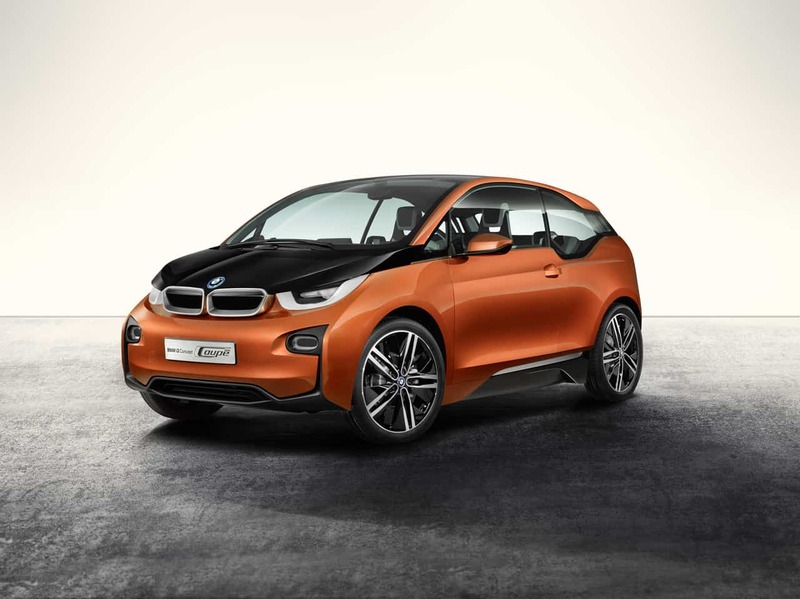 The clean sheet design takes two forms – the “life module” and the “drive module.” The life module – the i3’s passenger cell – uses carbon fiber-reinforced plastic (CFRP) to trim weight while maintaining the strength of steel. The boxy i3 tips the scale at just 2,700 pounds and earns the distinction of being the first regular-production car to pack a carbon fiber passenger cell. The BMW i3 is powered by a 22 kWh lithium-ion battery pack mounted under the passenger compartment and a 170-horsepower, 184 lb-ft of torque synchronous electric motor. Power is sent to the rear wheels via a single-speed transmission, enabling the i3 to sprint from zero to 60 mph approximately seven seconds.The BMW i3 doesn’t have to be fully electric: An optional 650cc, 34-horsepower two-cylinder gasoline-burning range extender works like a generator to provide the battery with additional charge.Without the range extender, the i3 is essentially relegated to urban motoring thanks to its 80 to 100-mile range. Drivers can select one of three drive modes: Comfort, ECO PRO and ECO PRO +, each of which tailor the car’s powertrain and air conditioning in order to preserve charge as needed. All BMW i3’s of trim level come standard with front and side curtain airbags, electronic stability control, brake assist, a brake drying function and traction control. The BMW i8 will headline the i-car lineup when it goes on sale in 2014. Conceived as an alternative to today’s sports cars, the sleek new coupe aims to provide the best of all worlds: a Porsche 911’s straight-line performance.The i8’s interior is pure sports car. You sit low with your legs well out in front. The seats are lightly padded. The deep but low dashboard is prominent. The instrument binnacle has graphics that change depending on the driving mode, going from a calm blue in eco-pro and comfort to a racier orange hue in sport mode. Mesmerizing. The plug-in hybrid will reportedly weigh in at 3,197 lbs with a 2+2 seating configuration and pop-up door design. Powering the BMW i8 will be a 170-hp electric motor driving the front wheels, while a turbocharged 1.5L three-cylinder powers the rear wheels with 223-hp and 295 lb-ft of torque. Despite earlier rumors that a non-hybrid, M-variant of the i8 would be in production, ideas of a V8- or V10-powered i8 has been tossed out the window. That’s no real surprise as BMW really wishes to push the future of its technology with their i-model lineup. The new i8 can be front-, rear-, or all-wheel drive thanks to a clever black box. Fully charged, the BMW i8 can cover 20 miles in full-electric mode. 0-62 mph is in a mere 4.9 seconds when all 393-hp and 406 lb-ft of torque is in effect. 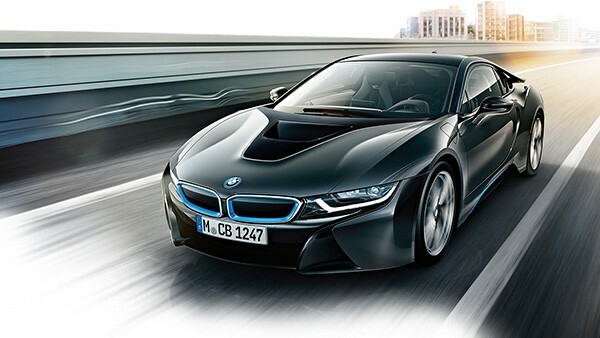 The i8 will feature a four-speed transmission and in the European driving cycle it’s reporting 104.2-mpg.